When thinking about our yummy brown bread back in Austria, my mouth immediately starts watering and I have the image of a crunchy and at the same time juicy bread in my head. Only that this bread contains plenty of wheat or rye flour and therefore is an absolute no-go for us gluten-free folk. 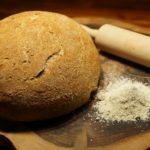 After experimenting quite a while I succeded in developing a gluten-free brown bread recipe which very much resembles its Austrian original – and as my family would say, it tastes even better than that. Oat flour, brown rice flour, corn starch, tapioca starch, psyllium husk powder and locust bean gum powder (gluten-free brown bread). 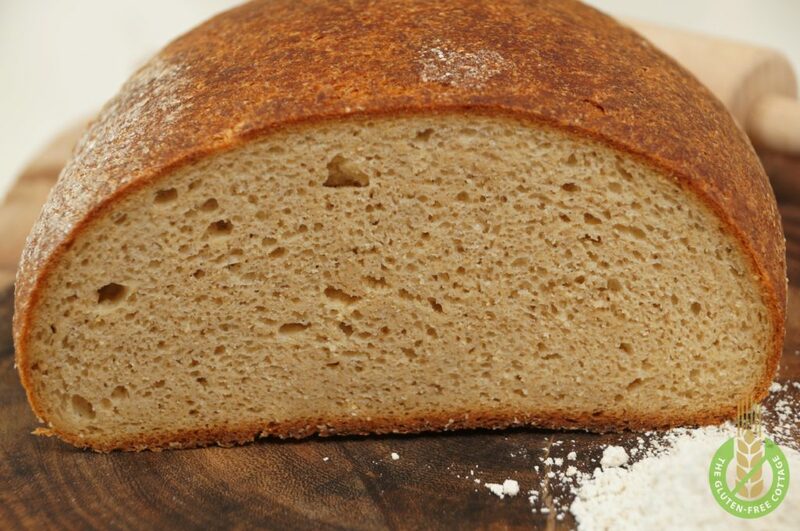 Yeast with small bubbles (gluten-free brown bread). The sticky bread dough now has to rest at a warm place for about 1 hour (gluten-free brown bread). 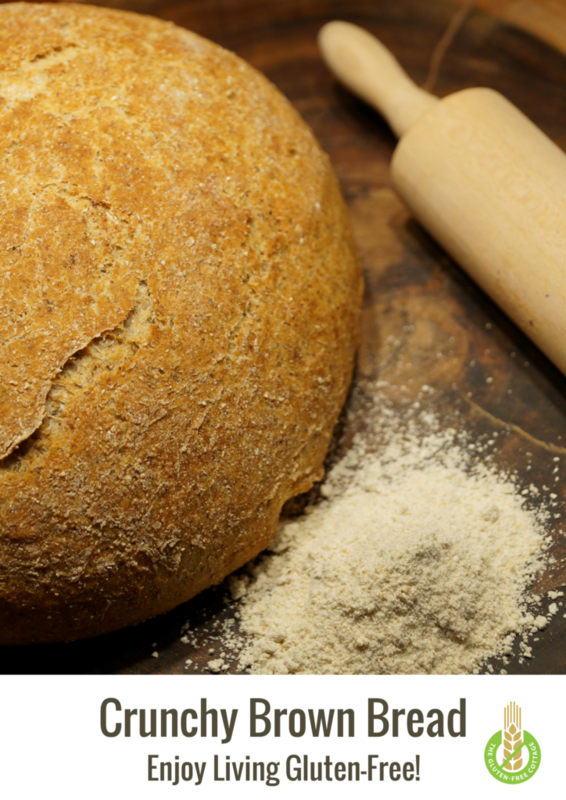 After the first rise the bread needs to be kneaded by hand until you can make a nice firm loaf. 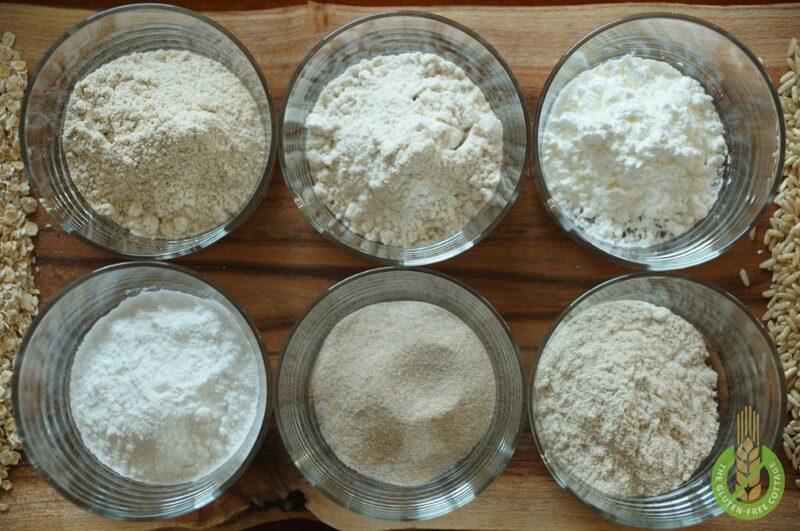 Add more oat flour as needed (gluten-free brown bread). 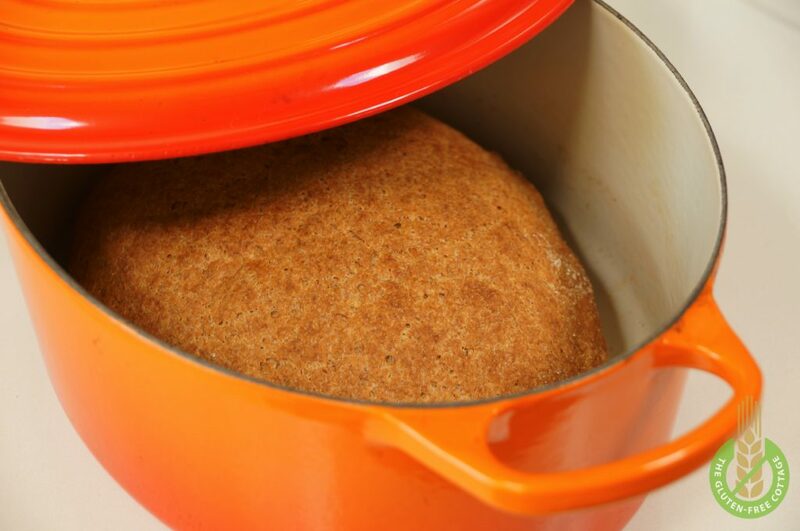 The icon-cast “Dutch oven” helps the bread to become crispy at the outside and at the same time soft at the inside (gluten-free brown bread). Gluten-free brown bread with a nice crispy crust. You will also need a big enough “Dutch oven”, i.e. an enameled cast-iron cooking pot with approx. 6 liters [≈ 6 quarts] with a tight-fitting lid. Put all “yeast” ingredients in a small cup, stir it thoroughly and let it rest for a couple of minutes at a warm place until you see small bubbles at the surface. Then pour the “liquid” ingredients in an extra bowl and mix it. 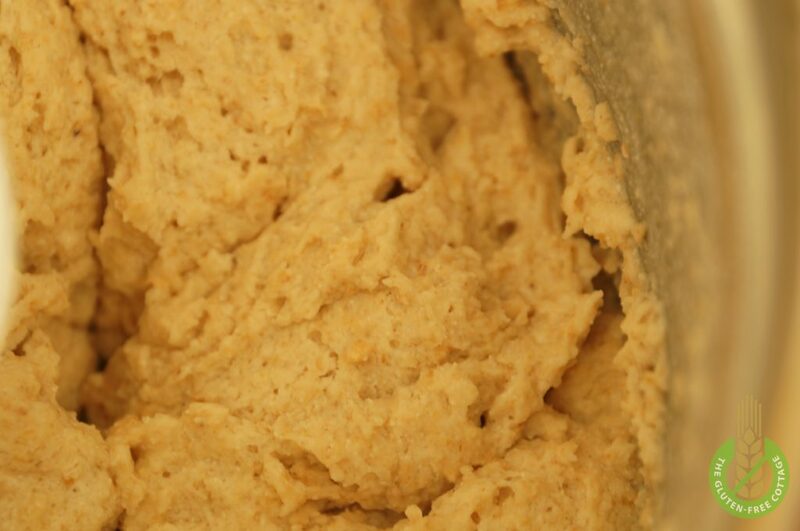 Now add the “yeast” and “liquid” ingredients to the “dry” ingredients and let it mix for a couple of minutes, until the dough gets a bit less sticky (during mixing the psyllium powder takes some water out of the dough and gives it more “structure”). First rise: Place the bowl at a warm enough place (e.g. put it in a warm water bath), cover it with a plastic foil and a tea towel on top and let the dough rest for about 1 hour, until its size has approximately doubled. Now scrape the sticky dough out of the bowl with a rubber spatula, put it on a surface covered with oat flour and knead it shortly with your hands. 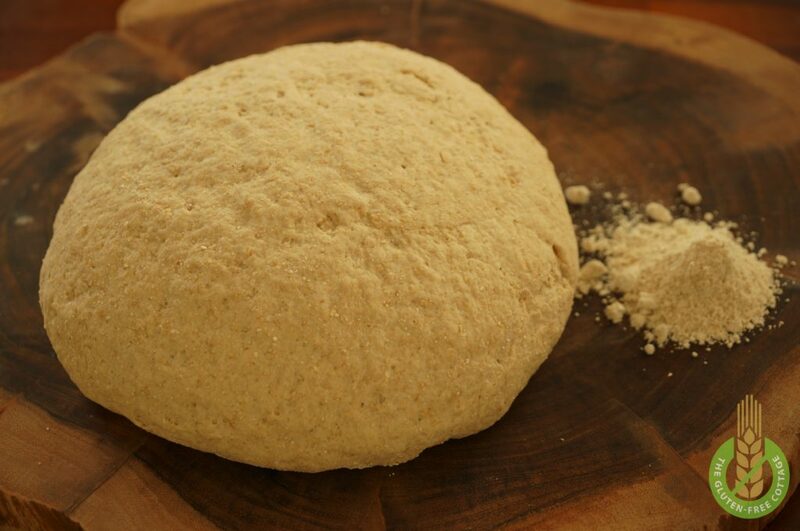 If necessary add some oat flour and continue kneading it until you can form a nice firm loaf. Second rise: Let it rest for another 20 minutes at a warm place so that the raw bread loaf can rise again (by approx. one third in size). Sprinkle its surface with a little bit of flour and cover it with plastic foil and a tea towel on top. In the meanwhile turn on the oven at a very high temperature (e.g. 270 °C/ 520 °F) and put the empty Dutch oven in it (don’t forget the lid). After about 20 minutes take the hot Dutch oven out of the oven, take the (hot!) lid off and place the raw bread loaf carefully inside the very hot Dutch oven (I mostly just let it drop inside). Now place the lid back and put it in the oven again. 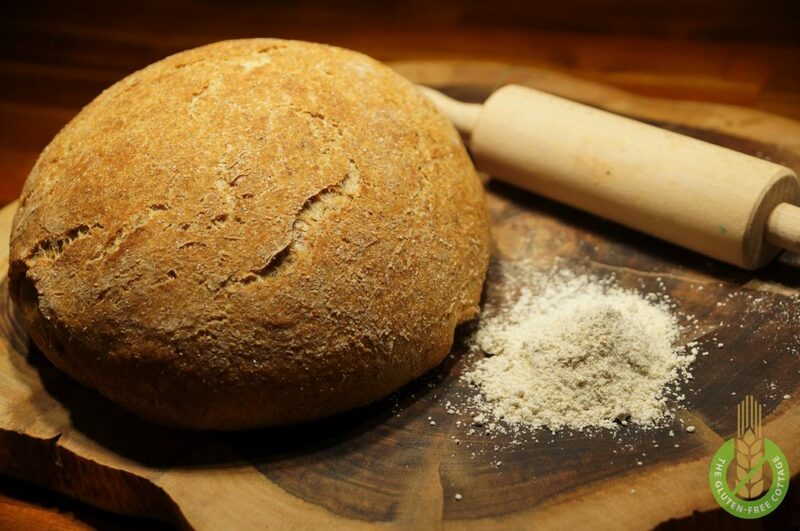 Bake: Let the bread bake for about 30 minutes with the lid on, then take the lid off, decrease the oven temperature to 220 °C (430 °F) and let bake for another 25 minutes, until the crust gets nice and crunchy. Now take the Dutch oven out of the oven, take the hot bread out and put it for another one to two hours on a baking rack to cool. Enjoy your crunchy gluten-free brown bread! If you cover the dough with plastic foil and a tea towel on top you will help it rise much better. 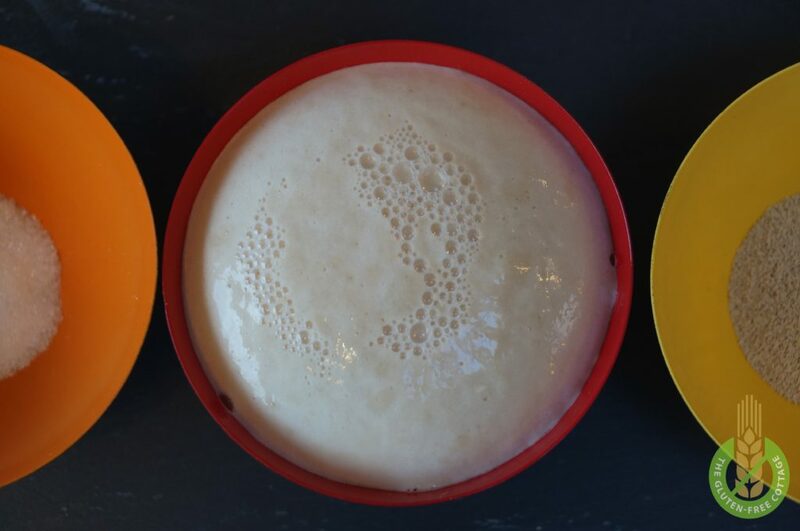 A rising yeast dough likes to have it warm and moist. Hi, thanks for your nice and helpful comment! If you have any questions on the topic I would be more than happy to assist. Also, I always appreciate new ideas on gluten-free bakery products which I could try. for the dilemma and found most individuals will go along with your website. Thanks for your positive feedback. 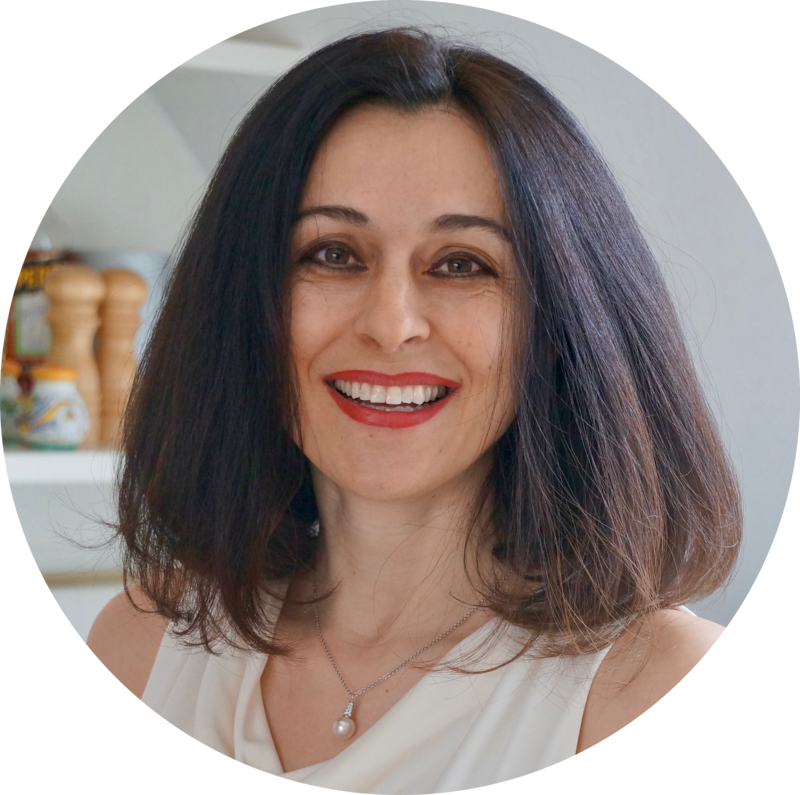 I am glad you are interested in gluten-free baking and the challenges it poses. Thank you so much for your nice comment. I am happy I could help you! ?